No Sherman could—on paper at least—stand up to a Panther, but the U.S. had the priceless advantage of supporting airpower, plentiful reserves, and an overwhelming superiority of numbers. The German Panzer-kampf-wagen V (Panther) tank was superior to the American M4 Sherman in almost every respect, but it could not guarantee victory at every encounter. The Germans knew that their Panther, with its balanced design of firepower, mobility, and crew protection, was their best armored vehicle. It had a superior main gun and frontal armor. Its 75mm high-velocity weapon, while not as powerful as a Tiger’s 88mm, could easily penetrate a Sherman’s hull or turret at all battlefield distances. The frontal armor was 100mm thick and sloped to deflect shots. Its wide steel tracks gave it excellent cross-country performance and reduced ground pressure. The Sherman was at a disadvantage. Although it mounted 75mm cannon, it was of a low-velocity type. The Sherman’s designers felt that a low-velocity gun would last longer than a high-velocity one. They failed to realize that few Shermans would ever last long enough in combat to wear out their barrels. Later versions would have an upgraded high-velocity gun, but they would not reach front-line units until late November 1944, five months after the Normandy invasion. The armor, at 81mm, was considerably thinner than the Panther’s and unable to withstand its armor-piercing ammunition. But the Sherman did have some advantages. Its thinner armor made it lighter and more maneuverable on solid ground, an important advantage in the cold, hilly terrain and small villages of Western Europe. Also, the Sherman’s turret had a much quicker rotation rate than the Panther’s, usually allowing American crews to get off the first shot in combat. The Sherman also enjoyed a greater reliability than the Panther, which was more prone to breakdowns and mechanical difficulties. 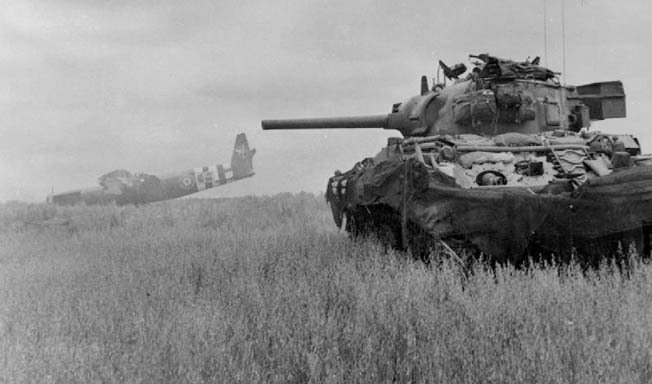 No Sherman could—on paper at least—stand up to a Panther, but the U.S. Third and Seventh Armies had the priceless advantage of supporting airpower, plentiful reserves, superb logistics, and an overwhelming superiority of numbers. With its speed and ability, the Sherman could outflank the enemy armor, leaving many of them to face American tank destroyers and aircraft. In the final analysis, there were simply too many American tanks for the Germans to deal with. The American war industry, free from bomber raids and supported by a motivated work force (Germany resorted to slave labor) produced nearly 50,000 Shermans, more tanks than Germany and Great Britain made during the entire war. Germany only produced about 6,000 Panthers. From D-Day to the end of the war in Europe, American and Allied planes roamed the skies over occupied Europe, enjoying complete air superiority over the battlefield. Fighter planes often strafed and rocketed German front-line tanks and troops, while bombers destroyed production plants, supply depots, and petroleum, oil, and lubricant facilities. Closer to the ground, superior American artillery reduced German troop movement while pulverizing the enemy front line. As a result of the air superiority, American logistics overwhelmed the Axis powers. Replacement parts were always in abundance. Tank retrieval crews pored over the battlefields, often while the firing was still going on, and brought back Shermans for immediate repair. Meanwhile, the Germans were forced to leave any damaged or broken-down Panthers where they stopped. Sherman tank crews’ last great advantage was in experience, even though Germany had been at war six years before most of the American tankers invaded France. In early August, Adolf Hitler ordered that all new Panthers sent to the West would go to new armored formations rather than depleted divisions. Thus, Germany’s veteran tankers received lighter Mark IVs, while new, inexperienced crews got the better tanks. So whenever Americans faced off against the Panther, they were usually more skilled in the tactics of close combat. 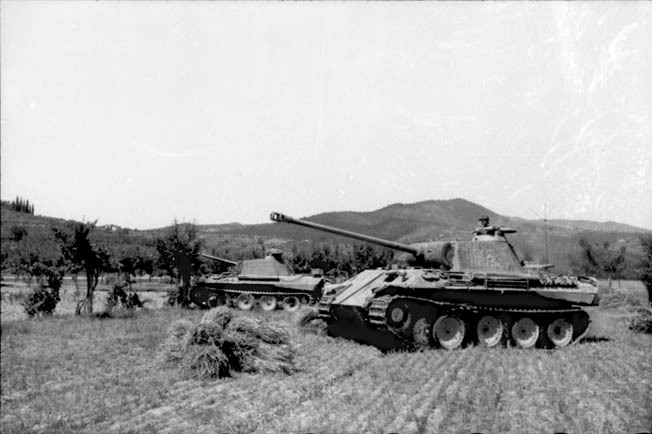 Two Panthers take up a battle line in a farmer’s field near Ravenna, east of Bologna. Tags Adolf Hitler, American, artillery, Axis, Axis Powers, battle tank, battlefield, Britain, cannon, close combat, D-Day, Destroyers, Enemy Front, Europe, France, German, Germany, Great Britain, lance, Mark I, Mark IV, Mark IV tank, Normandy, Normandy Invasion, OSS, Panzer, POW, Raven, Ravenna, Royal Air Force, Russia, Sherman Tank, Tanks, Tern, Tory, Troy, war in europe, wehrmacht, WIN. Re. Sherman tank : A friend of mine, Belton Y. Cooper 3rd armored division, wrote the best book I have found regarding the Sherman tank. Titled “DEATH TRAPS” it covers his experiences from Normandy across France Belgium, and Germany until VE day. Every student of World War ll history should find it interesting and very informative. Coopers book may well be interesting and the parts that he was actually witness to may well be informative. Much of the book is sadly NOT what he actually saw and also often incorrect. Yes I have read that sadly much of his book is second hand accounts that are not entirely factual. If you look up online you can find many have researched some of his second hand facts from primary source material and they do not line up. After action reports are a good source on this. He paints a somewhat sensational story of the poor performance of the Sherman that sold many books but is not entirely factual. The Germans called them Tommy Lighters, because they used Aviation Gas while the Germans used Diesel.When hit they exploded n caught fire. Actually, the Germans also used Gasoline engines in all of their tanks. The Russians were the only ones who used diesel engines in their tanks. The various myths and truths in this article are bewildering. “Death Traps” Belton coopers memoirs aside is pejorative in the extreme as the only at Normandy and the Bocage were the M4 really beat up, and that was more a matter of terrain and tactics then superior armor. As a matter of record it was far safer in a M4 than carrying an M1Rifle. The M3 gun was not able to penetrate the Frontal armor of Panther true. but Tanks are not always so lucky to be forever in perfect position the sides of the Panther could be penetrated by the American 37mm at 600 yards and by the M3 75mm at 1500 yards. As long as it was a battle of maneuver the M4 was as good as the Panther in a static positonal fight the Panther was better. The final bit is most correct though, Training and Spare Parts and Numbers make the M4 force the better one in France. The germans mainly used diesel engines on their tanks, towards the end of WW2 they might have scavenged a few gasoline engines to keep their tanks running but they mainly used diesel. This is a very common misconception, one that I held for some time. The German Army ran on gasoline, not diesel, even though Rudi Diesel was a German engineer. The Navy adopted it, but not the Army. Hah, the Germans ran on horses, then on gas. All german tanks from 1939 PzKw I until 1945 PzKw VI (King tiger) uses maybach gasoline engines. No one had ever tried to fit a diesel power unit in german tank. I remember my uncle telling me that the shells from our Shermans bounced off the German tanks. He wasn’t one to tell stories. It used 2 Porsche 101/1 10cyl Petrol (gas) engines going to electric drive motors. I’d like to correct a few points. Firstly the German tanks were designed with the role of being anti tank weapons whereas the Sherman was primarily an infantry support tank. The Panther had a far superior armour piercing projectile whereas the Sherman had the better high explosive round with double the tnt in the warhead. You can’t have both a great AP and HE round. The Sherman’s 75 mm gun was perfect for advancing the infantry and keeping down infantry casualties. The Sherman had the right gun for it’s primary role. The Panther had an inadequate gun for infantry support but that was not it\’s primary role. On the thickness of armour, the Mark 4 had the weakest armour and the armour on the side of the Panther body and turret was weaker than the Sherman. For all three of these tanks, increasing the vulnerable armour another inch would only add weight and create major drive train problems without adding protection. It does not matter if a Sherman’s armour is 2 or 3 inches thick when the German 75 mm and 88 mm ap rounds from anti tank guns and tanks can all penetrate in excess of 4 inches. The burning problem (tommy cooker) was common to German tanks too and was the result of ammo storage. This was corrected in the Sherman with ammo storage that was fully cased in a steel bucket vs a strip of steel to hold the ammo in place, and the addition of water jackets in the fall of 44, a simple fix. Finally German production suffered from designs that were excessively complicated and labour intensive which limited production, while the Sherman was a mass production assembly line tank in the US auto manufacturing tradition of Henry Ford using commonly available and proven parts, not components designed from scratch. The Sherman was also designed to be reliable and easy to repair wheras German tanks were neither. The Americans also standardized on one design and achieved economies of scale unlike the Germans with three mutually exclusive designs. Unless you insist that the Sherman be compared only in the long range anti tank role, it is the better tank. The Sherman was an inferior beast that was crushed by the Mark IV. The Panther really had them for lunch because of its poor gun, awful armor, high profile. It was not for nothing that it was called the Tommy Cooker or the Ronson for no reason. The Sherman didn’t influence future design in any important way. The Panther was the basis for all modern designs. It was faster, more stable, better armored, in all ways better except for reliability-and this is up for debate. Considering the logistic support of the American Army problems coyuld be addressed quickly and shortages were unheard of. The main roblem of the Panther lie in its overly complicated design rather than any inherent flaws. The Germans designed the Panther in such a way to improve survivability but complicated maintence. That was their choice, one that I doubt the Panther’s crewmen protested. One wonders what the crews of the Tommy Cookers would say. Overly complex is a FLAW. the Main engine had to be at proper rev to keep hydraulic turret drive working well. vision for the gunner was small. ” (Panthers) burnt too easily, the fuel and oil systems were insufficiently protected, and the crews were lost due to lack of training.”- Heinz Guderian. wheels being a bear to work on. And when you can find a bridge that will support it. in a real battle field the Pz V was found to be a bit less impressive while the Sherman a gets better due to far better automotive drive. You need to do some research. The Sherman at 29 MPH was faster than the Panther which was limited to 26 MPH because of it’s weak drive train. A Panther was not permitted to tow a disabled Panther for this reason. A Sherman with it’s robust drive train could tow a second Sherman. The Panther and Tiger with their torsion bar suspensions and overlapping wheels were technological dead ends and did not influence modern tanks. The 75 mm Sherman had the best infantry support gun in Normandy and the British Sherman firefly with it’s 17 pounder gun could kill Panthers and Tigers with ease at combat ranges and did so very effectively. When a Firefly was up against a Panther the first shot determined the kill. 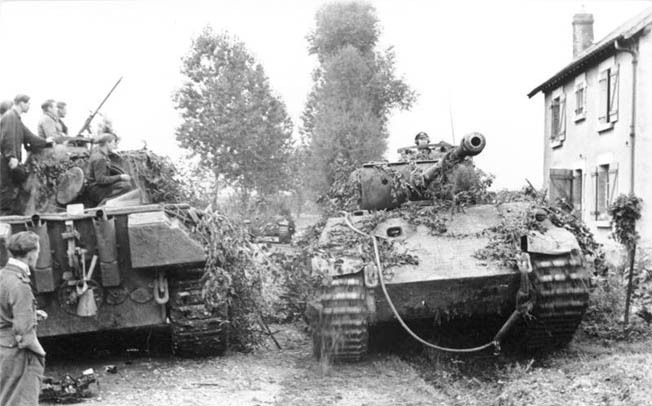 Where the Germans actually took the offensive in Normandy against the British and Canadians, instead of hiding in ambush, the performance of the Panther was not that good, and they burned like Shermans when penetrated and the cordite in their stored ammo was ignited. The bocage country where the Americans were fighting was not tank country. You should read about the Battle of Aracourt where Paton’s 75mm Shermans kicked the crap out of the Panthers that outnumbered them by outmanouvering them and putting AP rounds through their weak turret and hull side armour at shorter ranges. Again, try doing a bit of research. The Germans referred the Shermans as “Ronsons” as in Ronson cigarette lighters because the Sherman’s propensity to light up when hit since they were powered by air cooled air craft radial engines. As an aside contrary to mythology German tanks were not powered by Diesel engines but by Maybach gasoline engines. The Russians were theonly force to field large numbers of diesel driven tanks (The T-34 was powered by a Klimov diesel derived from castings based on the American WWI Liberty aircraft engine! The “ronson” story is true, but what is seldom said with it is that ALL tanks had fire issues and it was not the fuel, it was the Main Gun Ammunition. The wet storage and relocation of storage lowered the issue on the M4. It of course would always be an problem as crews often kept more live rounds in the turret basket for faster reload. How can the Ronson myth be true when the advert did not exist until after WW2? The Sherman tank has been the victim of bad press. To correctly judge the effectiveness of the weapon system in my opinion the first thing we must consider is it’s producibility. The US had so many tanks that it was able through lend lease to equip half the British forces all the free French and Chech forces and some Russian units with this good quality machine. While at the same time equipping it’s own forces with enough tanks that even US infantry divisions had 2 battalions of Sherman’s 1 of m4 and 1 of tank destroyer variant m10 or m36…Now that’s something! Also the m4 could be equipped with many different guns. It’s large turret ring was designed to upgrade as needed. During ww2 it housed the 75 mm howitzer, 105 mm howitzer, 76 mm high velocity and 90 mm high velocity (m36 and m36b1). The Sherman was so tough that it was able to accommodate another 6 tons of extra armor if needed… See Sherman Jumbo. The suspension was also upgradable. Variants with HVSS had comparable ground pressure to Panther and T-34. The Sherman had a 1 axis stabilized gun. This was useful in situations that required a quick peek from cover and a quick shot then a quick return to cover for repositioning no other tank was better at this than the Sherman. Sherman’s fire control system was much better than on T-34 and Panther. Gunners had a quick acquisition and a magnified sight. The Sherman’s observation system was so good the Russians used it in their post war designs. The main drawback of the Sherman was US anti tank guns of ww2 it wasn’t until the end of the war that the US had an anti tank gun that could reliably penetrate the front plate of a Panther tank at combat ranges. And so if a Panther couldn’t be flanked artillery had to be called, if arty couldn’t find the range they called in air, If air couldn’t hit the target… They were stuck. That’s why the Sherman has the reputation it has today US anti tank gun technology was a bit behind, and by the time it was solved the war was over. It’s kinda of embarrassing in this day and age that anyone seriously interested in armored warfare could be writing let alone letting this sort of fiction past an editors desk. There is virtuality nothing correct in this write up, its the sort of verbal garbage I would expect from an edgy teen who gathered his information from video games. Yeah, this story is all the bad pop history created by board gamers, the history channel and Belton Coopers Ghost writer. Sad stuff. I think patriotic illusions are at play here. See the video where a maintenance officer tells about the death cages he had to retrieve to put them as quickly as possible into action again. Sometimes with the blood of the last crew still in it. That fast they were recycled at the front. But he called it pure murder to send troops into battle with the Shermans. Also, if the Battle Academy wargame is any good in its calculations, the Shermans and M18 Hellcats were worthless in battle. Then its a very poor game. In the western front the Sherman’s kill ratio was 3 to 2 that is 3 German AFV killed to 2 Sherman lost. The Sherman also had the best crew survival of any tank in WW2 on average 1 crew member would be lost for each tank killed as opposed to say the T-34 that was 1 crew member lived for each one lost. As others have stated its a shame to see such a poor article repeating the many myths that have built up around the Sherman. Overall the Sherman on the western front was 3 Kills to 2 Losses vs German AFV. Not bad for a tank on the offensive most of the time. In comparison the Panther was 1 Kill to 3 losses vs the Sherman when on the offensive. (1)It was not particularly good off road, because of narrow tracks. Shermans tried to cross a particular field in Europe that German tanks had previously cross, and got bogged. (2) Early Gun (75mm) was terrible had had bad penetration, though 76mm replacement was better. (3)Armour thickness on the front was not great in comparison to the Panther, though side was comparable. (4) Speed was slower than Panther, and about the same as a Tiger, even though it weighed a lot less. It’s true, it was comparable to it’s most commonly fought opponent, the Panzer IV, however it was inferior to the Panther. Most importantly…. the armour on the sherman was so bad, they generally got destroyed by Panzerfaust, panzershrek and AT guns. The Sherman was more reliable, however once the kinks in the Panther were ironed out, (Ausf G) it was reliable as well, so no great advantage. Upgraded Sherman’s were killing T-55’s (Six Day War and Yom Kippur War) while the vaunted Panther, Tigers and other German tanks rusted in the dustbin of history. And the Sherman continued to soldier on into the 1990’s (Chilean Army)…not bad for a what the ill-informed and ignorant consider a “dud” of a tank. I don’t know where to begin with this fictitious article; I’ll address just one issue — the “experience” of the M4 crews. The M4 had hardly begun to see combat in Western Europe when all those “experienced” crews were wiped out to the point that the Shermans were subsequently crewed in part by infantrymen who were given an hour’s training before the next slaughter. Plus, where did the M4 tank crews get that experience before seeing first combat? The M4 was the last tank standing only because so many were made. The manufacturing capacity of the U.S. was such that it could literally build tanks faster than the Germans could massacre them. The U.S. could make so many in fact, that it could supply all its allies with the M4 as well as itself. The U.S.’s allies thought very little of the tank which the Germans nicknamed the “Tommy Cooker” after encountering the M4’s supplied to the British (one of many fatal flaws in the M4 is that it ran on highly flammable gasoline instead of diesel — one hit equaled one fireball). The best authority on the subject is the fact-filled book written after the war by Captain Belton Cooper which he entitled, “Death Traps.” Belton was an armored division logistics officer responsible for recovering all the knocked out Shermans and deciding whether to cannibalize them or write them off. Maintenance crews worked 24/7 trying to keep the Shermans on the job as each new batch of them were destroyed on the field. The same loss/replacement truth holds for the B-17 bomber of which 5,000 were lost during the War. The B-17 was still flying at the end only because 12,000 were built. The Allies on the western front had inferior weaponry but unlimited manufacturing capability and military manpower after the USA entered the war. The Russians had learned the hard way through huge losses of men, weaponry, and territory that, to win, they had to improve their weapons, particularly tanks, and engage in immense suicide attacks against the Germans. The so-called strategy of all the Allies was to overwhelm the Germans with weaponry, masses of soldiers, and attacking on multiple fronts. Consequently, Allied material and personnel were immensely dispensable. Saying that the Allies on the western front had inferior equipment is not a viable point historically. The SMLE #1, Mark 3 and #4, Marks 1-2 were certainly equal rifles to the Gewehr 98 and Kar 98 rifles, and the M1 Garand and 1903/03A3 Springfield rifles were equal to the Germans. The 1911 Colt was equal in most respects to the Walther P38 Pistol and superior to the P08 Luger, while the Thompson submachine gun was more than a match for the MP40 submachine gun. The mortars were generally equal, the M2 heavy machine gun was superior, and its only the MG 34 and 42 machine guns that were superior to the Vickers Maxim, 1917 and 1919 Browning .30 caliber machine guns. In the air, US and British fighters were equal to or superior to the Germans, especially late war. The Germans never produced a plane equal to the B17, B24, and only equal to the B25 and B26 bombers. The Dauntless and Helldiver dive bombers were definitely better than the JU87 Stuka, while a DC3/C47 was better than the Ju 52. The Stuart could best a PZ 1 or 2, and could hold its own against a PZ 3. The Sherman could hold its own against a PZ 4, but, yes, against the Panthers and Tigers, it was outclassed, especially with the short barreled 75mm gun. With the right ammo and tactics it could still beat the Panther or Tiger, but it was not able to stand on its own until it at least got the 76mm gun, and that would of only put it on par with the T34/76 tanks. Saying that Allied equipment overall was inferior to the Germans is not true, while in most regards Allied equipment was equal to or better than both the Italian and Japanese. Apart from the fact that the US 3rd (Cooper’s division) and 4th Armored Divisions actually were destroying MORE german tanks than they were losing. The Sherman never used high flammable fuel. It used the same 80 octane fuel as every other vehicle in the US arsenal, except for the Diesel powered M4A2s supplied to the Soviets in the Lend-Lease program and Marines in the pacific. Belton Cooper’s “Death Traps” is a memoir, not a historical nor technical work, far from fact-filled, and is actually riddled with innacuracies and second-hand accounts with no bibliography or footnotes. It should also be noted that many of the claims are debunked by a variety of primary sources. The Sherman was overall techologically superior to most german tanks, even if relatively undergunned and armored, they could capitalize on strategic mobility, crew awareness and fire control, usually having the “see first, shoot first” advantage, wich is found to be the mainly deciding factor in tank combat. And lastly, the 75mm gun was superior to the soviet 76mm gun, with the 76mm being superior to the 85mm in penetration, but inferior in high-explosive capability. Leo, let’s not confuse the discussion with facts..The only thing I would add to your reply is mention of the SUPERIORITY of the M3 75mm gun. The majority of shooting done by a tank was with HE rounds, AP fighting against other tanks was the minority of its work. The allies won the war because we had a collective of 100’s of thousands of tanks blowing the hell out of the axis armies, their supplies, their MG’s, their rear areas, etc. Grim Reaper – Our weapons were not inferior. People that learn history from TV documentaries will come away learning that the Germans created only great weapons and the allies won only with numbers. Read the history of the Panther and how much of a disastrous machine it was, many catching fire in the beginning and still breaking down regularly in the end. One of the worst aspects of the machine was that other than the tank commander most of the crew of a Panther could hardly see out of the machine…i.e., they were blind in combat. The 75mm gun of the Sherman was one of the best tank guns of the war because it had a great HE round (HE being the most widely used round by tanks in WWII) and it could kill a Panther at less than 1000yds with a shot to the side. A little research will show you that tank fights were won by best tactics, not best gun and armor. Ed – From the looks of it I would guess that you’ve only read one book on the M4 Sherman tank and armored fighting in WWII. The U.S. and British forces kept very good records during the war as well as doing studies of what was going on. It helps figure out how to fight in the future. The British had a tough time with the M4 (which they loved) because they were fighting in an area with pretty much the densest saturation of anti-tanks guns compared to any other place in the war. Yes, they suffered losses but if I recall the allies kicked the crap out of the Germans and their super tanks at the same time. Yes, the M4 burned, from its load of gunpowder not gasoline, a common amteur mistake. It burned like every other tank that got hit and penetrated but the U.S. introduced wet stowage of the ammo to reduce this, which it did. You are completely misinformed about the experience of American tankers in 1944 compared to the Germans. The Germans had been fighting since 1939 and had suffered losses in all theatres so by 1944 had very few experienced crews and commanders comparatively. While some units were forced to use inexperienced non-tankers as replacements this was the exception, not the rule. Compare to the Germans that were sending crews out with very little training because they could not afford to spare the gasoline, ammo or time to train their crews. Do a little research and see how many tanks a panzer division had in 1944. Studies show that tank battles were won by better tactics and that the Americans and Brits were winning those battles. Cooper had a job that was pretty tough and would give a fairly biased view of the fighting, a view of the losses in one of the divisions doing some of the toughest fighting. Interestingly there were tankers fighting in the ETO that never saw an enemy tank, certainly never all those Tigers that were supposed to be running about. I always find it amazing that the issue of gasoline engines is still talked about to this day…every German tank had a gasoline engine too, were they faulty as well? How else would the Panthers catch fire so easily. This video helps clear up some misconceptions pertaining to American Armor in WW2 with factual information from original sources. Panther was a far more sophisticated & well thought out weapon..
– than the Sherman too, in ‘flotation’, climbing ability, & crew comfort..
‘quality’ as a pattern, & not the lesson of the ‘expendable’ Sherman..
planes ( ‘cept the jets) the PBI on the front line didn’t..
such as machine & A/T guns, mortars & rocket launchers were superior..
SS-trooper, with his StG-44, ‘Kraut’ style helmet & camo-pattern outfit.. Irony is that an American Fascist played a large part in the defeat of Fascism in WW2. If not for the use of Ford’s assembly line the armament industry never could have produced weapons and parts in high enough numbers to change the tide of the war. The Panther tank was a Lemon. It had terrible observation, sights, and drivetrain. If you cannot shoot, move, and communicate your armor and gun performance is useless.